Posted at: 9/11/2011 01:00:00 AM . Ten years ago I was in high school on long island. At 8:46, I was sitting in US History daydreaming while the teacher droned on. Who would of thought that thirty miles away in New York City, our world was changing forever. In Pennsylvania, passengers on flight 93 fought back and prevented the terrorists from reaching their target. And in Washington DC a fourth plane crashed into the Pentagon. It's hard to think that this was a decade ago because it's still fresh in many of our minds. 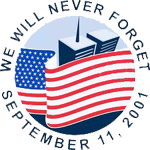 As time goes on, we must always remember those that lost their lives in this national tragedy. Never forget the people that died that day and the families they left behind. Today, on the tenth anniversary, the National September 11 Memorial will be dedicated and open to the public. If you are planning to visit the memorial, they are currently using a reservation system because it is still an active construction zone. So where were you when the world changed forever?